This is a favorite bridal portrait done at the Old Fort at Fort Niagara State Park in Youngstown, NY. Heather and Clay had a beautiful day for a wedding in 2016. They both got ready down the road from the park. The ceremony and reception were both at the Youngstown Yacht Club, also down the road. For photos, they wanted to go into the Old Fort. After working with the wedding party, they were sent to their cars and it was time for bride and groom portraits. There are so many underground tunnels at this location. So much history. This one was perfect for the bride! The light is pouring in. Neal wanted an action shot. Heather had a light weight dress, which helped to create a lot of movement. 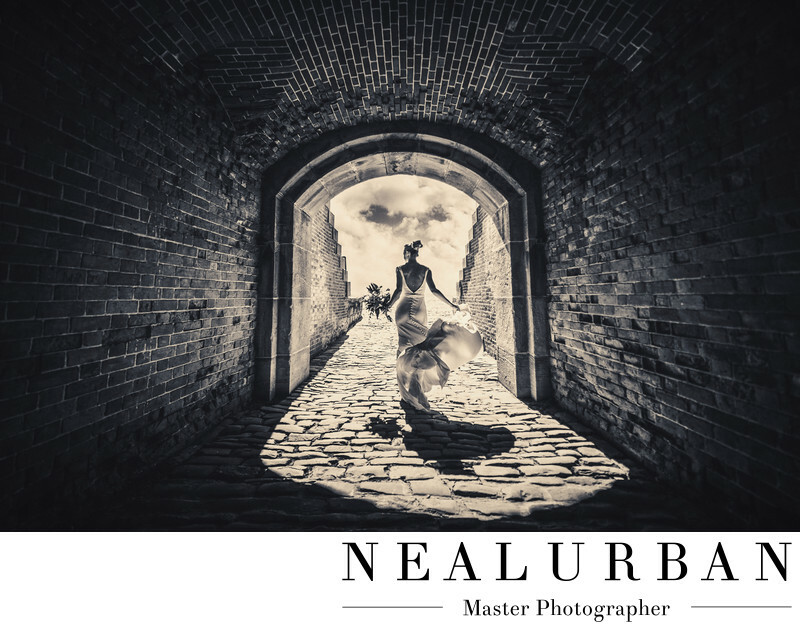 Neal told the bride he wanted it to look like she was running out of the tunnel toward the light. She actually did run! As she was heading out, she looked to the side and brought her bouquet out. She was holding her dress to the other side. This helped with the movement in the wedding dress. It was great balance on both sides. It created a beautiful shadow on the stones too! There are so many textures at this location as well. The direction of the bricks in the tunnel create leading lines to the outside. Then there are the giant cobblestones on the ground. We gave the bride so much credit for jogging on the stones in her wedding heels! She did an amazing job and the image is breath taking!